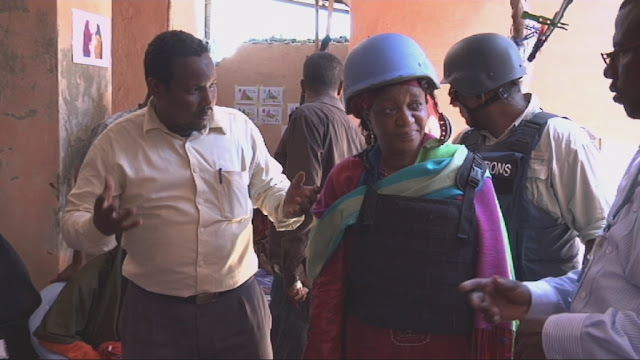 Mogadishu, Somalia: The United Nations Special Representative of the Secretary-General on Sexual Violence in Conflict (SRSG), Zainab Hawa Bangura, has visited Mogadishu (2-3 April), Somalia's capital, to raise awareness and discuss ways of addressing sexual violence in the country. SRSG Bangura met with UN officials, civil society partners and a range of stakeholders to listen and learn about the challenges faced in tackling sexual violence. SRSG Bangura's first trip to Somalia also included a visit to the Tarabunka IDP (internally displaced people) Camp - the biggest in the capital. She also visited a health centre where victims of sexual violence are given free medical treatment and taught vocational skills like hena design - a highly sought-after traditional dyeing technique used by women to decorate their bodies on special occasions. SRSG Bangura said the focus of this first visit was on information gathering to help inform future conversations with the government. SRSG Bangura said: "My visit is to gain first-hand knowledge, to listen, to hear the content of what is happening in relation to sexual violence, to be able to know what and where are the gaps, and what can we do to be able to work with the government and the national stakeholders on the ground to address this problem of sexual violence." SRSG Bangura said a team of experts from her office would be deployed to Somalia in July 2013 to work alongside the Police Commissioner and the military to carry out a needs assessment for training and prosecution, and would provide assistance as requested.